In Niger farmers are saving trees to protect the land from erosion and to sell tree products, and thus reclaiming farm land from the desert. Beginning in the mid-80's, following years of drought and population growth, farmers in Niger began to plow and plant around trees, rather than clearing them as in the past. This gave farmers branches for fire wood, pods for animal feed and fruit that can all be sold or used at home. The trees' roots fix the soil in place, preventing it from being carried off with the wind and preserving farmable land. The roots also help hold water in the ground, rather than letting it run off across rocky, barren fields into gullies where it floods villages and destroys crops. The roots of some trees also deliver nitrogen, with fertilizing properties, to the soil. And the leaves become fertilizer after they fall to the ground....A factor in tree conservation has been a change in the law, which, since colonial times, had defined trees as state property. 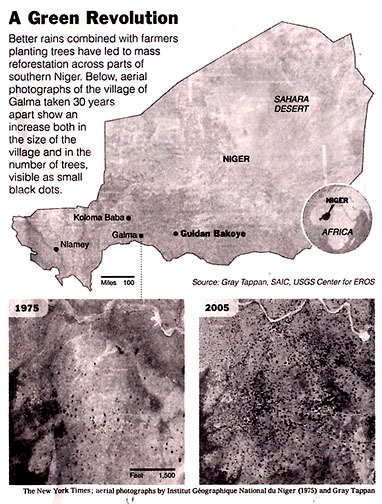 The government of Niger, an area twice the size of the state of Texas, lacked means to protect trees against harvesting for construction and firewood. With the emergence of the concept that people owned trees on their land and in their communities, people began to appreciate the advantages of preserving trees....In one village a group of widows puts manure in pits they have dug in barren soil. Rainwater carries the manure into the surrounding soil, reclaiming the land for farming....These successes have come from the local people working together, not from international aid groups' management. Severe drought in the 1970s and '80s, coupled with a population explosion and destructive farming and livestock practices, was denuding vast swaths of land. The desert seemed determined to swallow everything. So Mr. Danjimo and other farmers in Guidan Bakoye took a small but radical step. No longer would they clear the saplings from their fields before planting, as they had for generations. Instead they would protect and nurture them, carefully plowing around them when sowing millet, sorghum, peanuts and beans. In Niger's case, farmers began protecting trees just as rainfall levels began to rise again after the droughts in the 1970s and '80s. ''The density is so spectacular,'' he said. Mahamane Larwanou, a forestry expert at the University of Niamey in Niger's capital, said the regrowth of trees had transformed rural life in Niger. Wresting subsistence for 13 million people from Niger's fragile ecology is something akin to a puzzle. Less than 12 percent of its land can be cultivated, and much of that is densely populated. Yet 90 percent of Niger's people live off agriculture, cultivating a semiarid strip along the southern edge of the country. Farmers here practice mostly rain-fed agriculture with few tools and no machinery, making survival precarious even in so-called normal times. But when the rains and harvest fall short, hunger returns with a particular vengeance, as it did in 2005 during the nation's worst food crisis in a generation. 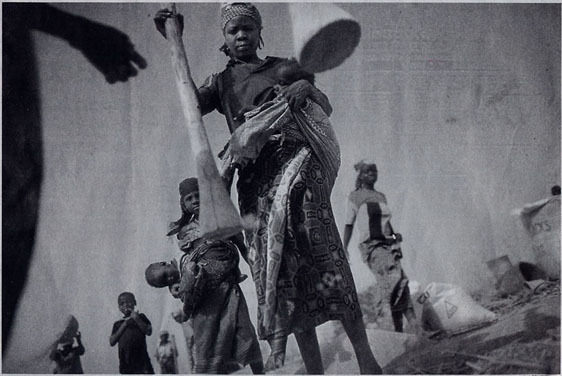 Making matters worse, Niger's population has doubled in the last 20 years. Each woman bears about seven children, giving the country one of the highest growth rates in the world. Ibrahim Idy, a farmer in Dahirou, a village in the Zinder region, has 20 baobab trees in his fields. Selling the leaves and fruit brings him about $300 a year in additional income. 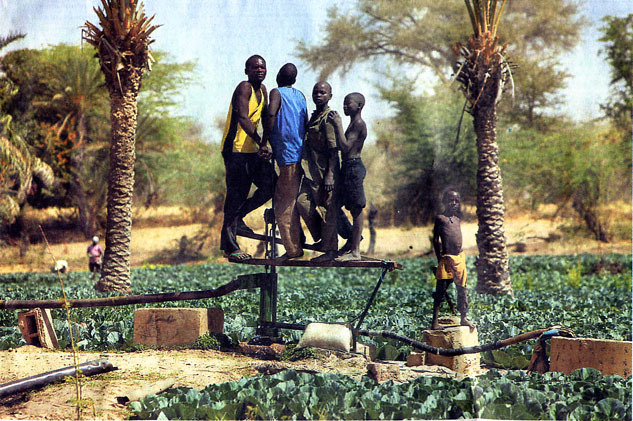 He has used that money to buy a motorized pump to draw water from his well to irrigate his cabbage and lettuce fields. His neighbors, who have fewer baobabs, use their children to draw water and dig and direct the mud channels that send water coursing to the beds. While their children work the fields, Mr. Idy's children attend school. In the village of Koloma Baba, in the Tahoua region just south of the desert's edge, a group of widows have reclaimed fields once thought forever barren. The women dig small pits in plots of land as hard as asphalt. They place a shovelful of manure in the pits, then wait for rain. The pits help the water and manure stay in the soil and regenerate its fertility, said Dr. Larwanou. Over time, with careful tending, the land can regain its ability to produce crops. In this manner, more than 600,000 acres of land have been reclaimed, according to researchers. ''I produce enough to eat, but nothing more,'' said Hadijatou Moussa, a widow in Koloma Baba. Such problems raise the question of whether the success of some of Niger's farmers can be replicated on a larger scale, across the Sahel. While Niger's experience of greening on a vast scale is unique, scientists say, smaller tracts of land have been revived in other countries. ''We are many and the land is small,'' he explained, bouncing on his lap a little boy named Ibrahim, the youngest of his 17 children by his three wives. Dr. Cook's long-term projections, based on a variety of climate models, point to longer and more frequent dry periods in the Sahel, caused by rising temperatures in the Gulf of Guinea. ''This is the place in the world that just stands out for having vulnerability for drought,'' she said. Better rains combined with farmers planting trees have led to mass reforestation across parts of southern Niger. Below, aerial photographs of the village of Galma taken 30 years apart show an increase both in the size of the village and in the number of trees, visible as small black dots. Beginning in the late 80's, following years of drought and population growth, farmers in Niger began to plow and plant around trees, rather than clearing them as in the past. This gave them branches for fire wood, pods for animal feed, fruit to the markets, that can all be sold or consumed. The trees roots fix the soil in place, preventing it from being carried off with the fierce Sahelian winds and preserving farmable land. The roots also help hold water in the ground, rather than letting it run off across rocky, barren fields into gullies where it floods villages and destroys crops. The roots of some trees also deliver nitrogen, with fertilizing properties, to the soil. And the leaves become fertilizer after they fall to the ground....A factor in tree conservation has been a change in the law, which, since colonial times, had defined trees as state property, but the government lacked means to protect trees against harvesting for construction and firewood. With the emergence of the concept that people owned trees on their land and in their communities, people began to appreciate the advantages of preserving them....In one village a group of widows put manure in pits they have dug in barren soil. Rainwater carries the manure into the surrounding soil, reclaiming the land for farming....These successes have come from the local people working together, not from international aid groups' management.